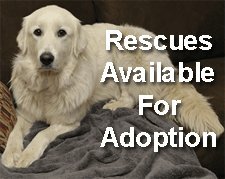 You go out for a short walk around the neighbourhood with your Great Pyr and you are gone for over an hour. The actual distance travelled is less than a kilometer. Why? Because you are walking with a GREAT PYR! If you own one; you know EXACTLY what I mean. It does not matter where we go, our dog Frank attracts attention. People stare at her, flock to her, touch her, tell her how beautiful she is and ALWAYS ask questions? "What breed of dog is that?" "Is that a white Newf?" "How do you keep that dog so white?" "How much does it eat?" "Do you keep it in the house?" If you are like me, you actually love talking about your dog, even to the point of fielding the same questions over and over. A Great Pyrenees is a definite show stopper and here in Barrie, we sure get a lot of attention when we are out about town. Small children are especially attracted to Frank. They spot her from a distance and immediately start dragging their apprehensive parent in our direction. I make eye contact with the parent right away. I smile and nod, letting them know its okay; which makes them relax. When they get close enough, I say "Yes, your child may pet my dog. She is great with children." The little ones don't just pet Frank, they "experience" her. 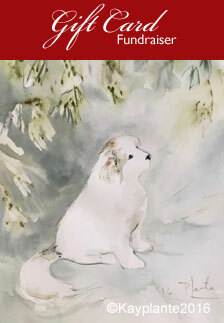 They wrap their tiny arms as far around her neck as they can and bury their faces in her soft, silky snow-white mane. Frank just stands there calmly while the children touch her... often from the tip of her coal black nose right down to her spectacular feathered plume tail. Frank, at 3 years old, is so accustomed to being "explored" by kids when we are out; she remains still, dignified, sweet and accessible. Frank however, is wary of men. She has a habit of "glaring" at men who approach us when we are out; giving off a subtle yet distinct message. I believe most Pyrs share this trait. Some of the best "walk" experiences I've had are from a distance. I am often in the background when one of my kids is walking with Frank. Out of our five children, the two younger boys love walking with Frank the most. Many such outings take place on the Barrie Waterfront. My 11 year old puts on his roller blades, grabs the leash and off they go. 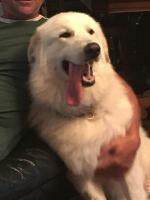 I follow behind and get a great view of our happy Pyr having a great time with her "human kid". Frank's tail always elevates higher when she is attached by leash to any of "her" children. I wonder if this indicates her level of "guardianship"? I could be wrong, but it seems like the higher the tail, the greater the degree of alertness and protection. When accompanying my son on blades, Frank prances right along beside him as if she were "best in show" going around the ring at the Westminster. People stop in their tracks and smile at the sight. Many turn and watch them go by and as I follow behind, I hear their comments; "What a lovely dog! It looks like a white bear." and my favourite is "Oh my God! That dog is bigger than the kid!" It's true. Frank outweighs my son by 50 pounds. Once, when I caught up with them at the ice cream shack, a small crowd had already gathered. As Frank stood guard at his side, my son did a pretty good job answering the questions he has heard many times. 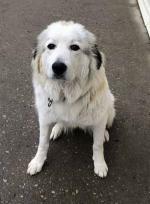 "She is a Great Pyrenees. It is a type of mountain dog." "Nah.. She doesn't have webbed feet; she has awesome dew claws though. See?" "I dunno, the dirt just kinda falls off on its own. Plus our cat grooms her all the time. Its pretty funny to watch." "Lots. My Dad says she eats better than the Queen." 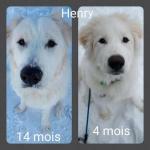 "Nah... Lots of Pyrenees are white like this, and some have darker fur." "Only in spring and fall. The rest of the time her fur stays just like this. But when she sheds it's CRAZY. My mom vacuums her, and she just lies there cuz she really likes it." "Sure. But she also likes to go outside. Most of the time she is with us though. If my mom is in the kitchen, then that's where Frank lies down. It's like, wherever we are, she's there too. She stays inside at night and watches over us. She is really, really protective." As I approached, my son smiled, handed me the leash and said to a gentleman standing just off to the side, "Okay, my mom's here, so Frank will let you pet her now." and off he went to get his ice cream. I glanced over curiously at the man, who smiled back and said, with admiration in his voice, "It's okay. I think I will just admire her from a distance. That is one great dog." Everyone wants a picture with a Pyr. It is wonderful that they attract so much attention and I hate to bring up the down side but I will. One lady used to see Clara up on the porch or out walking with us and always comment on how good she was, how beautiful and ask all the questions. I would always make sure to tell them the other side. No one really listens to the other side of the Pyr and claim that all dogs are like that. Independent, don't listen and they bark, yes, they say, mine is like that, too. 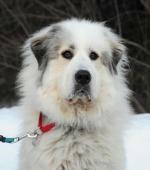 This lady went out and got a Pyr because of Clara. Her Pyr pup was extremely shy with people. She complained about the holes she dug in her yard, how much she barked and how she would get out of the yard and not come back. I asked her if she had done research on this breed and she claimed she had. I saw this same lady from a distance a year later with a small dog by her side. 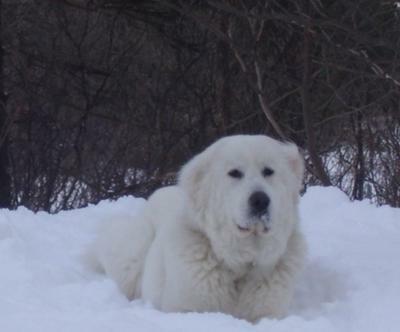 I don't know where her Pyr went but I know I no longer see it in the neighbourhood nor does it live with her. This is not the first time I have seen this happen. People think this is an easy dog and that they are self-grooming, always stay white and because they are so quiet that they must listen well and not bark. 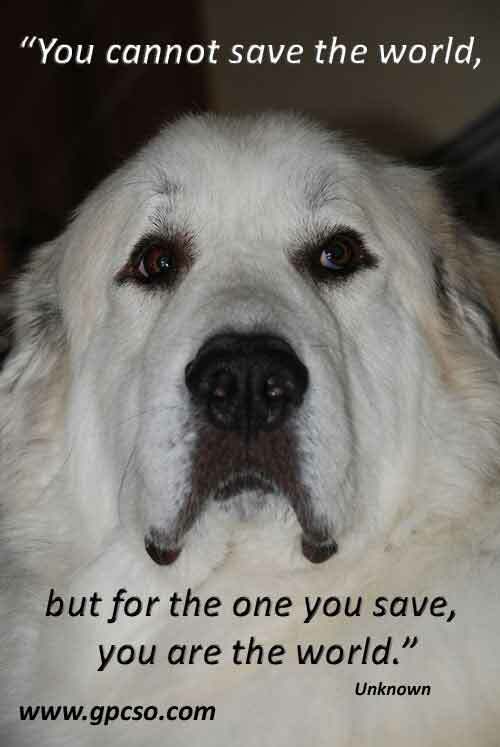 The Pyr pays the price in the end.